Sheffield City Polytechnic had invested significantly in the early 1980s in video production technology. Whilst crude by current standards this technology facilitated as George Barber noted, a far more accurate editing practice than had previously been possible, and cameras were becoming more portable (though still not an inconsiderable weight and bulk). Three two-machine Sony U-Matic ¾ inch video tape format edit suites, a multi camera TV Studio with vision mixing desk and recording facilities and both Umatic and Betamax video cameras with ‘portapak’ portable (slung from a shoulder) video field recorders would greet my arrival as a ‘fresher’ in September 1983, and be my first real access to video shooting, recording and editing technologies. Sheffield City Polytechnic’s Psalter Lane Art College would also play a key, pivotal role, in the shaping of the multimedia focused nature of so much of the unique music scene in Sheffield at this time. The influence of art schools on the post punk and new wave culture echo Frith and Horne’s (1987) tracking of the close connections between British popular music culture and the art colleges from the 1950s to the 1980s. Equally significant in the 1980s would be the influence of the art colleges on video practice. Elwes (2005, p.117) and Curtis (2007, p.24) note the handful of emerging fine art programmes that would begin to develop media departments from the late 60s onwards. Psalter Lane was one amongst this small band of pioneering institutions and by the early 1980s had their own Communication Arts department facilitating a fine art degree route whereby students could follow a very self directed learning route through studio based practices exploring film, video, performance, photography and sound production, supported through tutorials and visiting lectures. It was onto this course that I was accepted in 1983, and through which I would be able to further develop my own creative media practice. Both Richard Kirk, of Cabaret Voltaire, and Adrian Wright whose role in Sheffield based electronic pop pioneers The Human League was initially a non-musical one as ‘Director of Visuals’ for live performance, had spent time at Psalter Lane; St John Walker and Peter Care both produced films and videos with and for Cabaret Voltaire, whilst students on the Communication Arts programme at Psalter Lane (released on the Doublevision video label), and there were numerous close associations between the Sheffield music scene of the time and the art college, both as a venue hosting numerous bands and as a catalyst for all kinds of encounters and collaborations. Coming into contact with other Scratch video work through screening View From Hear at the Fridge in Brixton, London, and having access to U-Matic video edit suite technologies as a student at Psalter Lane , the work that followed would exploit these technologies far more and be very much influenced by the Scratch methodologies of re-working off-air footage, as well as deconstructive and re-conextualising practices in industrial music contexts. Amen: Survive the Coming Hard Times (1984) solely reworks off-air video footage, deliberately unsubtle and affective in its edit content and style. Panning shots and movements in frame complimenting the sweeping drones in the music, flashing lights in the night and pointing fingers and hands matching rhythmic drum clashes. Ronald Reagan had come to power in the US on the back of a growing tide of right wing Christian fundamentalism, and with Margaret Thatcher’s British Government supporting the presence of US Nuclear weapons on British soil, the 1980s were dominated politically by a nuclear apocalyptic air in tandem with an authoritarian tone and austere economic management. Amen: Survive the Coming Hard Times was made as a reaction to and questioning of some of these pervading attitudes. Growing confidence, skills and access to video editing technology, and higher production values in the soundtrack composition, made Amen… technically a significant step forward on the earlier work on View From Hear. Amen… utilised emerging sound sampling and sequencing technologies in the construction of its soundtrack combining these with similarly sampled off-air footage, bringing together sampled sound and picture in the opening sequences of the ‘survive the coming hard times’ sound bite refrain. This work was selected by Andy Lipman to show in the first gallery screening of Scratch videos at the Institute of Contemporary Arts in London in December 1984. The work was also selected by Mark Wilcox and Michael O’Pray for the Arts Council funded, Film and Video Umbrella Umbrella Subverting Television touring programme of work, screened in the UK and Europe in 1985. The work became an exemplar of the overtly political, agit-prop style of Scratch (Meigh-Andrews, 2006, p.176), Elwes (2005, p.111) recognizing that such ‘clear political positioning representing collective opposition to state policies’ became one of Scratch’s long lasting legacies. Going on to acknowledge the radical credentials of scratch in breaking ‘the monopoly of broadcasting by commandeering its output’ (ibid, p.116) whilst forging new models of interactive cultural democracy and calling into question ‘the elevated status of artworks and the elitist position of the artist’ in making unlimited editions of work available through tape duplication (ibid). Subverting Television programme notes – front cover, 1985. 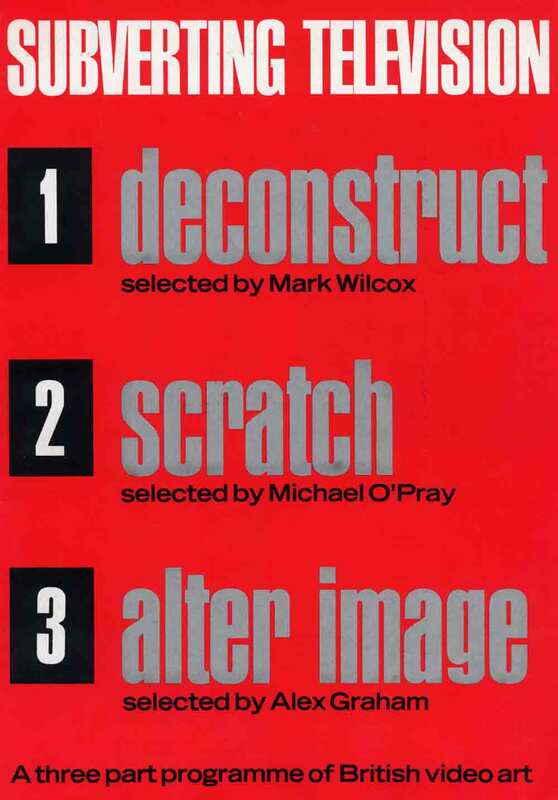 Mark Wilcox, de-construc’tion, broadsheet for ‘Subverting Television: a three-part programme of British video art’. London: Arts Council of England. As scratching and sampling technologies were enhancing recording studio technology and practices, feeding a burgeoning ‘remix’ culture; video tape offered the same prospects for revisiting and reworking not only off-air material, but self-generated content too. I was drawn to explore how else I could work with the video material I was producing. I would continue to develop a hybrid practice, shooting super 8 film, and working with film projections in conjunction with video recording and editing, producing three further pieces of work in 1985; Crisis of the Spirit, Firestorm and Health and Efficiency. Exploring through these formats and methodolgies the motivating themes outlined above. Amen… was reworked with footage generated through the construction of flicker film loops of alternating red, green and blue frames which were then projected onto water. With a video camera zoomed into and focused on the surface of a bowl of water, hand movements generated coloured dancing flashes of light on random ripples, flickering as single frames of colour from the films reflected on the agitated water. This would form the basis of the purely abstract Crisis of the Spirit, with looped sound bites, multi layered and slowed down and manipulated to create the soundtrack, repeating the phrase ‘a crisis of the spirit is difficult to show on television’. This footage in turn would be re-worked through playback in the Psalter Lane TV Studio and mixed with a camera feed shooting Amen… as it was played back on a TV Monitor. The subsequent material then slowed down and edited by means of a Time Based Corrector to form the basis of Firestorm. These three pieces all exploring apocalyptic tones and moods through differing formal explorations of the medium; abstract, semi abstract montage and overtly imagistic scratch video. Whilst all three pieces had original soundtracks, a further reworking of the Firestorm footage, cut together with an opening sequence of super 8 shot at a derelict power station in Nottingham, to a track by London based experimental post punk musicians This Heat would produce Health and Efficiency; where the opening and closing musical motifs accompanied by the Super 8 footage proffer a more positive and hopeful mood to the dark apocalyptic vision of Firestorm, as its visuals are embedded to the long heavy rhythms that sit at the heart of This Heat’s musical track. A second overt Scratch video produced in 1985, Suffer Bomb Disease, evoked in no uncertain terms a deeply apocalyptic nuclear vision, cutting off-air footage of a decimated Germany at the end of World War Two with nuclear test explosions and nuclear bomb blast damage footage. This Heat’s haunting and atmospheric soundtrack evoking a desolate tone. In significant musical contrast to much of the other Scratch videos of the day, a fact not missed by Adam Lockhart in selecting this work for the retrospective Scratch Video screening at Dundee Contemporary Arts, which he curated in 2008. A third Scratch piece was made as a direct personal response to the US bombing of Libya in April 1986, Friendly Fires. Once again this piece was intended be unsubtle and affecting, with screeching guitars and driving bass cut with the movement of planes through the frame effecting a visual dynamic, counterpoised by longer held static shots of children, and knowingly cynical shots of Reagan and Thatcher smiling and waving. This was deliberate, unapologetic, propagandist, oppositional, anti-militaristic, polemical and heart-felt film making. Friendly Fires cuts together the launch procedure of US cruise missiles and a voiceover soundbite of film director Lyndsay Anderson from a Channel 4 documentary, followed by Factory Records’ Section 25 track ‘Friendly Fires’. With off-air footage of military bombers from different campaigns including Vietnam, and footage of the US jets which flew from British airbases to bomb Libya intercut with the harrowing and famous footage of Vietnamese girl Kim Phuc and other children suffering the effects of napalm burns, as the lyrics intone ‘flying so high, flying so high, you can’t see them, you can’t hear them, they’re on their way over to you… and the little children have nowhere to run, they don’t even know what’s going on.’ Friendly Fires would complete a trilogy of Scratch pieces, which form a triptych, intended to be screened back-to-back, starting with Amen… followed by Friendly Fires and ending with Suffer Bomb Disease. With Amen… being billed in the Scratch screenings at the ICA and the Deconstruction FVU programme as Nick Cope/391, and Friendly Fires put together whilst I was concentrating much more on work as a core member of performance art group Fabricata Illuminata, this trilogy of Scratch videos map the transition of a moving image practice from its DIY rooted days arising from the Samizdat punk and post punk culture, establishing a hybrid moving image practice exploring film and video practices often in a performative and expanded cinema context, informed by and participant in the network of influences and connections that the independent post punk culture fostered; developed and supported by an engagement with the technological and academic environment of Sheffield City Polytechnic’s Psalter Lane Communication Arts department and the wider music and moving image culture prevalent in Sheffield at the time. By mid 1985, as the attention given to Scratch was waning, my own networks and pre-occupations were very much rooted in the vibrant Sheffield scenes, and I was collaborating with other music groups – working with Hula and In The Nursery assisting in projected live visuals during concerts in the UK and Europe, sharing a rehearsal/workshop space with The Anti Group, in addition to creating multimedia performances with Fabricata Illuminata. The latter would see a return to the ICA, being selected for the Best Of Live Art 1985 showcase at the London venue in April 1986, following performances in Nottingham, Sheffield, London, Brighton and Amsterdam. Video Lounge; The Fridge, Brixton, 1984. Scratch Television; ICA London, December 1984. School of Art, Amsterdam, May 1985. Institute of Film Studies, Enschede, Holland, May 1985. Time Based Arts, Amsterdam, March 1985. Die Fabrik, Eindhoven, Holland, March 1985. Institute of Contemporary Arts, London, June 1985. Metro Cinema, Derby, April 1985. Zap Club, Brighton, June 1985. Museum of Modern Art, Oxford, September 1985. Brighton Festival, Brighton, October 1985. Institute of Contemporary Arts, Video Library, London. Arts Council Film and Video Umbrella Collection, London. Scratch Video; Dundee Contemporary Arts, April 08. Scratch – installation; Streetlevel Gallery, Glasgow, March 2009. Taking its title from a video clip recorded from a news broadcast about right-wing US Christian fundamentalist survivalists, who had taken up residence as a quasi-military community in the Ozark mountains and saw it is their mission to ‘train for the end of the world’ and to ‘survive the coming hard times’. The work not only sampled the sound but also the video. Footage also included NASA scientists at the control panels of the Apollo 11 Moon shot, the 1968 Czechoslovakian uprising and Russian troops and tanks entering Prague, miners scrabbling for coal on slag heaps in the 1930s, and sailors battling to control tallship sails in a storm. A subtitled clip reads ‘whose evil hand is controlling them’ intercut with the NASA footage, intended to convey images of anonymous controlling male figures pressing buttons and viewing computer screens. The second half of the piece includes another subtitled clip reading ‘We’ve been treated like dirt for too long now’ whilst more oppositional images of resistance to the Russian military presence in Prague is seen. The piece ends with the famous soundbite of Ronald Reagan joking off-air during a sound test ‘[today I have passed legislation that will outlaw Russia forever] We begin bombing in 5 minutes’, over a static shot of a world war one military cemetery.